This morning on my daily run, I saw something on the sidewalk in front of me in the darkness. I had assumed that it was a garbage can lid or something of that sort. When I got close enough to make out what it was, I realize that it was a dead black cat. It was not what I was expecting but I veered to the right and continued past the feline that had met its demise under a car tire. As I finished my run, I gave some thought to what a “luckologist” might have to say about my experience. From one point of view, the cat was not able to cross my path. So my fate should be clean and clear. 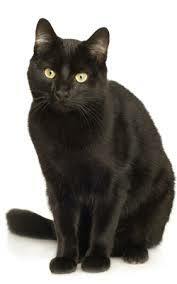 On the other hand, black cats are supposed to carry all sorts of bad omens. So having a dead one show up in your path could not be good. Before writing this I did a cursory search of the interwebs and found nothing concrete about dead black cats. So here I am at the end of my day that basically started with dead black cat. It was a pretty good day overall. Although it was busy and filled with lots of “to do” list items rather than “want to do” items, I really cannot complain. My day was not a product of the luck of the draw. I was the major factor in the fortune or misfortune that I experienced. Life is not a set of circumstances to avoid or omens to look for. It is a string of possibilities that we choose to act upon or let pass. The greatest predictor of your destiny is not how many mirrors you’ve broken or four leaf clovers that you’ve found. It is the actions that you take. The words that you say to a loved one when they need it most. It’s the helping hand that you give to someone that you barely know. Choosing to stand up when all you want to do is run away. These are the decisions and actions that decide your “luck”. Your good fortune is not something mystical that you have to fear. Your good fortune comes from a life of good action and recognition that you were “lucky” to be alive today, no matter how it went. Next postHow Does a Scorpion Scratch Its Belly?